Robert Downey Jr. has said that he is annoyed with his Iron Man bosses because they won't make him his own superhero suit. The 44-year-old actor, who plays industrialist Tony Stark and his metal-clad alter ego in the movies, was apparently told he could have his own version of the costume to take home with him, but is still waiting. He said: "The producers keep telling me that they're going to give me a suit with all the bells and whistles but I still don't have it. I don't know, maybe I should get it in my contract. It would be great to have one at home - a talking point." Downey continued: "I suppose it would be a case of worshipping false idols, which I don't have any trouble with as long as the idol is made in my image!" Looking for a dress-up outfit for the kids? 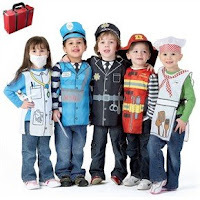 Check out this fantastic Occupational Dress Up Set, 5 great dress up outfits in a handy carry case: was £29.99, now £11.99.